3. Department of Pathology, Cooper University Hospital, Cooper Medical School of Rowan University, Camden, New Jersey 08103, USA. Background: Expression of PD-L1 has been estimated to predict the therapeutic potential of PD-L1 inhibition in solid tumors. Recent studies have demonstrated that PD-L1 plays a critical role in regulatory T-cell (Treg) development and functional maintenance. Although increases in FOXP3+Treg infiltration and PD-L1 expression have been revealed in several malignancies, their correlation in human breast tumors is as yet unclear. Methods: Whole-tissue sections from 501 patients with breast cancer were examined for PD-L1 and FOXP3 expression by immunohistochemistry. Correlation between their expressions and the association with clinicopathological features, intrinsic tumor subtypes and patient's prognosis were studied. Results: PD-L1 expression and FOXP3+Treg infiltrates in tumor tissue demonstrated a high correlation (rs=0.334, p<0.001) in this cohort of breast cancer patients. High PD-L1 expression and increased FOXP3+Treg infiltrates were both associated with high histological grade, negative ER and PR status, and aggressive intrinsic tumor subtypes, especially the basal-like subtype. Tumors with concomitant high expressions of the two markers had the worst prognosis. Multivariate analysis proved both markers to be the independent predictors for decreased overall survival of patients, particularly in the basal-like subtype. Conclusions: The results suggest that PD-L1 and FOXP3+Tregs may work synergistically and their up-regulated expressions promote tumor immune evasion in breast cancer. Combinatorial immunotherapeutic approaches aiming on blocking PD-L1 and depleting Tregs might improve therapeutic efficacy in breast cancer patients, especially those with basal-like carcinoma. Keywords: Breast cancer, FOXP3+Tregs, PD-L1, Intrinsic subtype, Prognosis. Programmed death ligand 1 (PD-L1) is a member of the B7 superfamily. It is a 40-kDa transmembrane protein that is encoded by CD274 gene located on chromosome 9 . Upregulation of PD-L1 has been described in several malignancies and closely associated with the clinicopathological status of patients with solid tumors [2-4]. Previous studies have demonstrated abundant PD-L1 molecules were expressed by both tumor cells and infiltrating immune cells and its inhibition result in an enduring clinical response in recent clinical trials of several solid tumors [5-8]. Recently, PD-L1 expression has been studied to predict clinical response to PD-L1 inhibition in order to estimate the patients who may benefit from the therapy . However, its expression and impact on the prognosis of patients with breast cancer is controversial in the limited reports [9-12]. Regulatory T cells (Tregs), a unique subset of CD4+ helper T cells characterized by the CD4+ CD25+ phenotype, can suppress proliferation and cytokine secretion of effector T lymphocytes through immunoregulation. FOXP3, a forkhead helix transcription factor, appears to function as a master regulator in the development and control of Tregs [13, 14], and is regarded as the most specific and reliable surface marker of Tregs [15-17]. FOXP3 is considered a biomarker and prognostic factor for human malignant tumors . In our previous study with 1,270 samples of whole-tissue sections, intratumoral infiltration by FOXP3+ Tregs was highly correlated with the intrinsic subtype and was revealed as an independent prognostic predictor for breast cancer patients [19, 20]. Persuasive evidence has suggested that PD-L1 plays a pivotal role in the induction and maintenance of Tregs that leads to expansion of Tregs in tumor microenvironment and these induced Tregs (iTregs) then inhibit T cell responses to tumor [21-24]. In vitro, PD-L1-coated beads can induce Tregs in the absence of exogenous TGF-β, indicating that PD-L1 signaling can facilitate the development of iTregs . In vivo, blocking PD-L1 signaling abolished induction in a tumor-induced Treg conversion model . So far, except for these in vitro or animal models, the link between PD-L1 expression in tumor cell and the infiltration of Tregs has been evaluated in patients with gastric and colorectal carcinoma [26-28]. However, this relevancy is as yet unclear in patients with breast cancer. In present study, we evaluated the expression of PD-L1 and the infiltration of FOXP3+ Treg in whole-tissue sections from a large cohort of 501 breast carcinomas, and further investigated their association with the clinicopathological features of the tumors, the intrinsic tumor subtypes and the prognosis of patients, according to REMARK recommendations . We selected 501 continuous cases of invasive breast carcinoma diagnosed at the Department of Breast Cancer Pathology, Tianjin Medical University Cancer Institute and Hospital, Tianjin, China in 2004 that were included in the prior study . It included 439 invasive ductal carcinomas not otherwise specified (NOS-IDC), 18 invasive lobular carcinomas (ILC) and 44 carcinomas of other histologic types. The patients were followed up for 1-80 months, with a median of 64 months, and the median age of the patients at diagnosis was 53 years (range 29-83 years). All the patients presented with tumors that were confined to the breast, without evidence of distant metastasis or skin involvement, and all underwent surgical excision with axillary lymph node dissection . No patients had received neoadjuvant chemotherapy or preoperative radiation therapy. Postoperatively, 461 (92.0%) patients received adjuvant chemotherapy, 195 (38.9%) received radiation therapy, and 350 (69.9%) received endocrine therapy. Patient's consent for research was obtained prior to surgery and the research was given official approval by the Institutional Research and Ethical Committee of Tianjin Medical University Cancer Institute and Hospital. 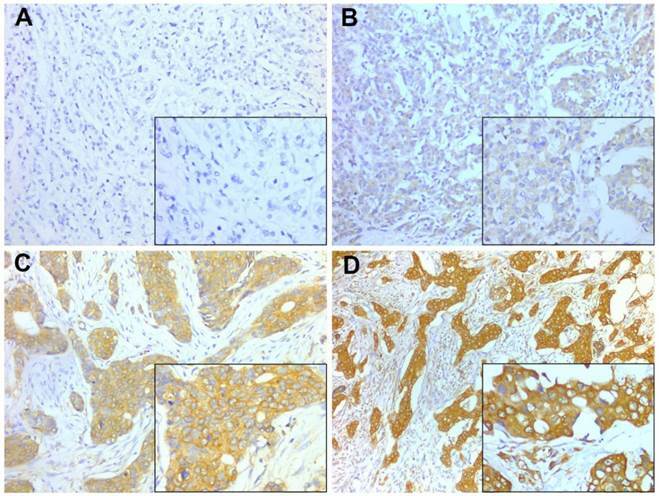 Immunohistochemistry for PD-L1 and FOXP3 was performed on whole-tissue sections using standard procedures. Briefly, 4-µm tissue sections were sequentially dewaxed and rehydrated using xylene and graded alcohol washes. Antigen retrieval was performed at 121°C for 2 min using citrate buffer, pH 6.0. After serial blocking with hydrogen peroxide and normal goat serum, the sections were incubated with a primary polyclonal antibody against PD-L1 (Abcam, ab58810, polyclonal, 1:500 dilution, Cambridge, UK) for 16 h at 4°C. The sections were then sequentially incubated with biotinylated goat anti-mouse immunoglobulin and peroxidase-conjugated streptavidin (DAKO). The enzyme substrate was 3,3'-diaminobenzidine tetra-hydrochloride. Incubation of sections with phosphate-buffered saline alone served as a negative control. PD-L1 expression in cytoplasm and/or on cellular membrane of tumor cells was considered positive and was quantified using the Histo-score (H-score) system by evaluation of the entire slide. A case was scored by the intensity (1+ = weak, 2+ = moderate, 3+ = strong) (Fig. 1) and the percentage of staining in invasive tumor cells. The H-score was calculated using the following formula: (3 × percentage of cells strong staining) + (2 × percentage of cell with moderate staining) + (1 × percentage of cells with weak staining), with the possible scores ranging from 0 to 300. PD-L1 expression was classified into two groups according to a cut-off H-score of 100 (0-99 = negative expression; 100-300 = positive expression). Immunohistochemistry for FOXP3 and its scoring were described in prior study . As previously described, the infiltrating density of intratumoral FOXP3+ Tregs was categorized as high or low relative to the median of 11 cells/0.0625 mm2 as the cutoff value. Statistical analyses were performed with SPSS 18.0 software (SPSS, Chicago, IL). Spearman's rank-correlation test was used to assess the association of PD-L1 expression with FOXP3+ Treg infiltration and clinicopathological characteristics. Chi-square tests were used to compare PD-L1 expression and Treg infiltration among intrinsic subtypes. The cumulative survival (overall survival, OS; recurrence-free survival, RFS) times were calculated using the Kaplan-Meier method and analyzed with the log-rank test. Univariate and multivariate analyses were conducted based on the Cox proportional hazards regression model. All tests were two-sided, and a P value of less than 0.05 was considered statistically significant. Among the 501 invasive breast cancer patient samples, 231 cases (46.1%) exhibited PD-L1 expression and 271 (54.1%) cases exhibited high FOXP3+ Treg infiltration. Significant correlation between PD-L1 expression and FOXP3+ Treg infiltration in breast cancer tissue was identified (rs=0.334, p<0.001) (Table 1). Moreover, PD-L1 expression and FOXP3+ Treg infiltration were both positively associated with a high histological grade (rs=0.118, p=0.008; rs=0.208, p<0.001), negative ER (rs=-0.123, p=0.006; rs=-0.374, p<0.001) and PR status (rs=-0.155, p<0.001; rs=-0.345, p<0.001), and the intrinsic subtype of breast cancer (χ2=13.821, p=0.008; χ2=90.941, p=0.001) (Table 1). Interestingly, the order of intrinsic subtypes in which the rate of FOXP3+ Treg infiltration increased (Luminal A < Luminal B < Luminal HER2 < HER2-enriched < Basal-like breast cancer) was entirely consistent with the order in which the PD-L1 expression rate increased (Table 1, Fig. 2). The expression of the two proteins were both inversely correlated with the intrinsic subtypes of carcinomas in term of their known prognostic significance. Representative PD-L1 staining intensities. Staining was localized to the cytoplasm and to the membrane of breast cancer cells. A, Intensity 0, no staining; B, Intensity 1+, weak staining; C, Intensity 2+, moderate staining; D, Intensity 3+, strong staining. A-D, original magnification × 200; inset ×400. Associations between PD-L1 expression and clinicopathological parameters. *P-values were calculated by Spearman's rank-correlation test to assess the association of PD-L1 expression and FOXP3+ Treg infiltration with clinicopathological characteristics. **PD-L1 expression and FOXP3+ Treg infiltration were compared between intrinsic subtypes by the Chi-square test (χ2=13.821; χ2=90.941). Percentage of patients with different breast cancer intrinsic subtypes exhibiting different levels of FOXP3+ Treg infiltration (***p<0.001) and PD-L1 expression (**p=0.008). Univariate analysis revealed that PD-L1 expression was an unfavorable predictor for OS and RFS (HR=2.544, p<0.001; HR=2.262, p<0.001) (Table 2; Fig. 3). Consistent with the results in prior study , infiltration of FOXP3+ Tregs was also an unfavorable predictor of OS and RFS in univariate analysis (HR=4.330, P<0.001; HR=2.418, P=0.002) (Table 2; Fig. 3). At multivariate analysis, after adjusting for age, tumor size, grade, lymph node stage, ER, PR and HER2 status, chemotherapy, radiotherapy and endocrine therapy, both PD-L1 expression and FOXP3+ Treg infiltration were independent prognostic factors for OS (HR=1.874, p=0.044; HR=3.178, p=0.003, respectively) and RFS (HR=1.725, p=0.044; HR=2.114, p=0.009, respectively) (Table 3). In subset analyses by intrinsic subtypes, PD-L1 expression was associated with decreased OS and/or RFS in the luminal A, luminal B and basal-like subtypes by univariate and multivariate analysis (Table 4). FOXP3+ Treg infiltration was associated with decreased OS and/or RFS in the luminal-HER2, HER2-enriched and basal-like subtypes by univariate and multivariate analysis (Table 5). We noticed that, in the basal-like subtype, both PD-L1 (HR=2.600, p=0.046) and FOXP3+ Tregs (HR=8.139, p=0.043) proved to be independent unfavorable prognostic factors for OS by multivariate analysis adjusting by age, tumor size, grade and lymph node status (Table 4 and 5, Fig. 4). 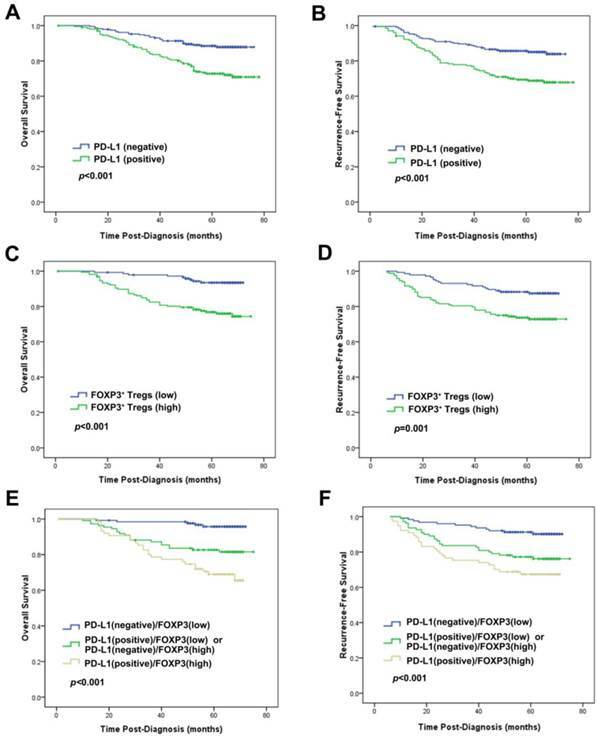 Prognostic significance of PD-L1 expression alone or combined with evaluation of FOXP3+ Tregs in breast cancer patients. Kaplan-Meier survival curve for (A) OS and (B) RFS depending on the expression of PD-L1. (C) OS and (D) RFS depending on the tumor FOXP3+ Treg infiltration. (E) OS and (F) RFS depending on the PD-L1 expression combined with the tumor FOXP3+ Treg infiltration. p-values were calculated by the log-rank test. One hundred and sixty-two (32.3%) tumors showed concurrence of PD-L1 expression and increased FOXP3+ Treg infiltration, while 171 (34.1%) tumors exhibited negative PD-L1 expression and decreased FOXP3+ Treg infiltration, and the other 168 (33.5%) tumors demonstrated neither of the above (Table 1). The group of the patients with the concomitant PD-L1 expression and increased FOXP3+ Treg infiltration showed the worst OS and RFS, while those with negative PD-L1 and low FOXP3+ Tregs demonstrated the best OS and RFS among the 3 groups. Patients with other combinative pattern of PD-L1 expression and Tregs infiltration exhibited OS and RFS in the middle of the groups (OS: χ2=27.937, p<0.001; RFS: χ2=17.467, p<0.001; Fig. 3). This result was particularly proved to be significant in the basal-like subtype (OS: χ2=7.387, p=0.025; RFS: χ2=6.950, p=0.031; Fig. 4). 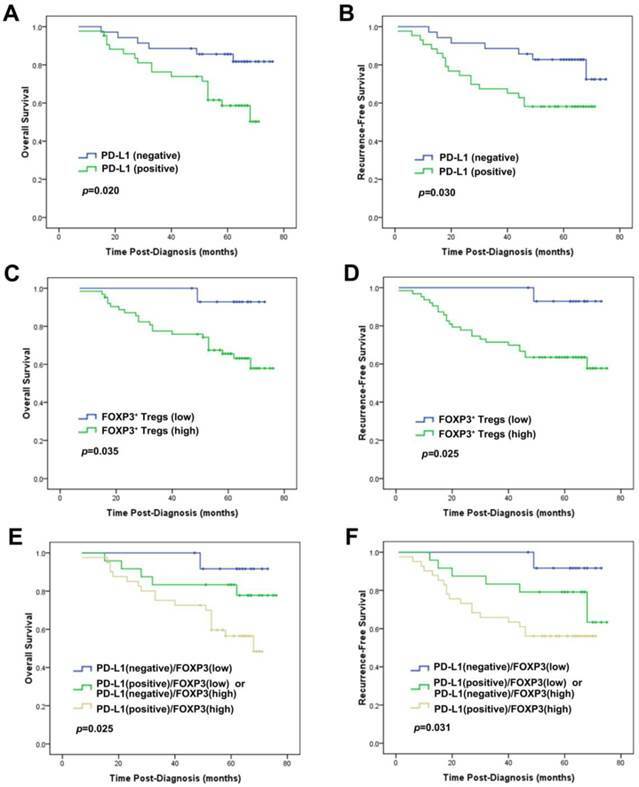 Prognostic significance of PD-L1 expression alone or combined with FOXP3+ Treg infiltration in patients with the basal-like subtype of breast cancer. Kaplan-Meier survival curves for (A) OS and (B) RFS depending on the expression of PD-L1. (C) OS and (D) RFS depending on the tumor FOXP3+ Treg infiltration. (E) OS and (F) RFS depending on the PD-L1 expression combined with the tumor FOXP3+ Treg infiltration. p-values were calculated by the log-rank test. Lymph node stage: N0, indicates no lymph node metastasis; N1, 1-3 lymph node metastasis; N2, 4-9 lymph node metastasis; N3, ≥10 lymph node metastasis. HR, hazard ratio; CI, confidence interval; OS: overall survival; RFS: recurrence-free survival. Multivariate analysis of pathological features, PD-L1 expression and FOXP3+ Treg infiltration with OS and RFS in breast cancer patients. Univariate and multivariate analyses of intrinsic subtypes regarding the effect of PD-L1 expression on OS and RFS in breast cancer patients. It has become clear that malignant cells must be able to successfully avoid immune surveillance to progress and metastasize. PD-L1, a co-inhibitory molecule, seems a major contributor to this process. PD-L1 induces cancer cell immune evasion by binding to its receptor PD-1 on activated T cells that results in tolerance of tumor-reactive T cells [30, 31], and in rendering tumor cells to be resistant to CD8+ T cells. FASL-mediated tumor cell lysis is also inhibited by PD1 and PD-L1 interaction . Recently, PD-L1 has been considered as an unfavorable predictor in a variety of malignancies [9, 11, 33-39]. Two prior studies using tissue microarrays (TMAs) of large sample size obtained quite different PD-L1 protein expression rates and opposite associations with clinical outcome of breast cancer [11, 40]. Ail et al reported PD-L1 expressed by tumor cell occurred in just 1.7% of tumors and associated with improved disease-specific survival. In contrast, Muenst et al. found PD-L1 expression in 23.4 % of specimens and reported its association with higher tumor grade, lymph node metastasis, diminished ER expression, and decreased OS. Considering the limitations of TMAs, including their inability to represent PD-L1 expression and to capture the immune infiltration accurately due to intra-tumoral heterogeneity, we chose to use the whole-tissue sections for the evaluation of PD-L1 expression in 501 breast cancer samples and an H-score system was adopted for accurate scoring. The whole-tissue sections allowed reliable observation of tumor FOXP3+ Tregs infiltration and PD-L1 expression that facilitate the concomitant evaluation of the two markers per our previous experiences . In this study we found PD-L1 expressed by tumor cell in 46.1% of specimens which was even higher than 23.4% reported by Muenst et al. used the same antibody clone and scoring system except for using TMA samples. However, their results of associations with vital clinicopathological parameters and patient prognosis were consistent with our findings. In addition, we also demonstrated a significant correlation between PD-L1 expression and the intrinsic molecular subtypes of the carcinomas. In two studies employing 44 and 69 cases of breast cancer separately [9, 10], Ghebeh et al. also identified that PD-L1 expression in tumor cells were associated with a higher tumor grade and negative ER and PR status. However, in their studies, no significant correlation with lymph node metastasis was found, and no follow-up information was provided. Two prior studies evaluated PD-L1 at the level of gene expression [12, 41]. Schalper et al. reported that 60% of breast tumors showed CD274 (PD-L1) mRNA expression in TMAs and was associated with increased tumor-infiltrating lymphocytes (TILs) and improved recurrence-free survival of breast cancer patients. Sabatier et al. report that CD274 (PD-L1) was upregulated in 20% of tumors based on DNA microarray data and was not associated with survival in the whole population. However, the limitations of the sampling effect of TMAs and the possibility of poor correlation between PD-L1 RNA and protein expression should be considered. The authors also suggested that the translation of these findings into the clinical setting could benefit from whole-tissue-section estimation or in combination with PD-L1 protein detection. Profound evidence has shown that Tregs and the PD-L1/PD1 pathway are pivotal to the maintenance of peripheral immune tolerance, and may involve in the same pathway. A novel role of PD-L1 in sustaining the function of iTregs has been suggested. PD-L1 was found to modulate the signaling molecules that are critical for the conversion of naive T cells to Treg cells [42, 43]. It can upregulate FOXP3 expression and therefore intensify its suppressive function . One previous report documented that the coexistence of FOXP3+ TILs and PD-L1+ TILs in breast cancer tissues is significantly correlated with unfavorable patient prognostic factors . The pivotal finding of the present study is to reveal the congregation of tumor cell PD-L1 expression and FOXP3+ Treg infiltration in the tumor microenvironment of breast cancer. The results pointed out to a possibility that PD-L1 signals might play an important role in immune suppression through regulating Tregs in the complicated suppressive network of breast cancer, although the accurate mechanism deserves is still elusive. Ongoing clinical trials targeting the potential PD-L1/PD-1 pathway have shown that PD-L1 inhibitors are safe, well-tolerated and have few autoimmune side effects [5, 46, 47]. The development of new strategy is particularly urgent in the management of basal-like carcinoma patients where therapeutic options are still remarkably limited. Multiple previous observations, both in cell lines and in tumor samples are concordant with our finding of enriched PD-L1 in basal-like breast cancer [11, 33, 34, 40, 41]. Recently, several clinical trials targeting the PD-L1/PD-1 axis in basal-like carcinoma have achieved tumor pathologically complete responses and improved patient's outcomes [48-50]. In present study, we found that both PD-L1 and FOXP3 showed their highest levels and strong associations with poor prognosis in the basal-like subtype. The combined evaluation identified that patients with the concomitant presence of high PD-L1 expression and high FOXP3+ Treg infiltration had the worst prognosis. Given the limited options for basal-like subtype treatment, a combined strategy to block PD-L1/PD-1 axis with simultaneous depletion of Tregs should be reasonable in enhancing the therapeutic efficacy of these patients. The potential benefits of this model have been demonstrated in a recent study of mouse renal cell carcinoma, in which mice showed long-lasting protective immunity and complete tumor regression when such a therapeutic modality was applied . Despite these promising results, the specific implication of PD-L1 inhibitors on Treg function has not been reported and should be further explored in future studies of breast cancer. The study demonstrates a significant correlation between two independent poor prognostic indicators of breast cancer: the tumor cell high PD-L1 expression and the increased tissue FOXP3+ Treg infiltrates. The results also suggest that PD-L1 and FOXP3+ Tregs work synergistically or participate in the same molecular pathway and their up-regulated expressions promote tumor immune evasion. The findings provide a theoretical basis for the development of immunotherapies targeting PD-L1 and FOXP3+ Tregs simultaneously in the treatment of breast cancer, especially the basal-like subtype carcinoma. These immunosuppressive molecules should be further explored to facilitate the development of anti-tumor immunotherapies for breast cancer. PD-L1: programmed death ligand 1; Treg: regulatory T-cell; TILs: tumor-infiltrating lymphocytes; ER: estrogen receptor; PR: progesterone receptor; HER-2: human epidermal growth factor receptor 2; RFS: recurrence-free survival; OS: overall survival; HR: hazard ratio; CI: confidence interval. Research supported by grants from the National Natural Science Foundation of China (Grant No. 81202101, 81302292, 81302294 and 31400673) and Natural Science Foundation of Tianjin City (Grant No. 15JCQNJC45300). Corresponding author: Fangfang Liu, MD, PhD, Department of Breast Pathology and Research Lab, Tianjin Medical University Cancer Institute and Hospital, Huanhuxi Road, Tianjin 300060, China. Tel: 86-22-23340123 Fax: 86-22-23340123 Email: pengzhirynnankai.edu.cn.